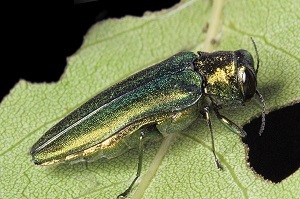 The Emerald Ash Borer is a highly destructive insect pest of the ash tree. Native to Eastern Asian, this pest was first discovered in Canada in 2002 and identified in the Niagara Region in 2009. 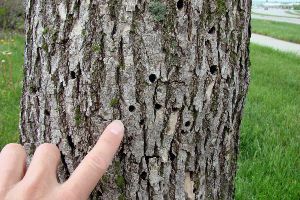 Unfortunately, there is nothing that can prevent the spread and infestation of this type of pest and this will eventually lead to the removal of all Ash trees in the City. While we are aware of this inevitable fate, The City of Niagara Falls is currently working diligently to remove trees according to priority; removing any ash trees that display severe signs of infestation and pose the most risk to public health and safety. This may result in crews visiting streets or parks multiple times during the removal season. The city will continue this approach until all of the Ash trees have been removed. Following a removal, the stump of the tree is ground down and the area restored with sod or seed. Once this is completed, a new tree will be planted in a nearby location. Depending on weather conditions and time of year, this process could take some time. Your patience during this process is greatly appreciated. Please note that if a city owned tree that abuts your property is scheduled for removal this coming year, you will have already received a letter from the city outlining this procedure. Evidence of adult beetle feeding on leaves. Long shoots growing from the trunk or branches. Vertical cracks in the trunk. If you discover signs of infestation in a city owned tree, please call 905-356-1355. Unfortunately, the city cannot assist in the removal or treatment of any trees that are on private property. For assistance with private trees that have been affected, you may want to contact a qualified arborist who is familiar with this type of infestation. 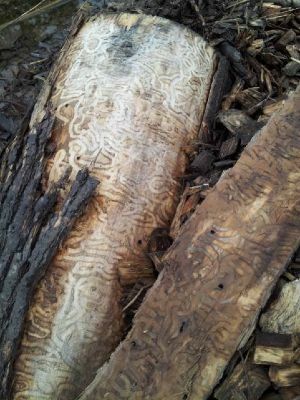 For more information on the Emerald Ash Borer, visit the Canadian Food Inspection Agency website.